What Car Has The Worst Proportions? In auto design, the fundamental proportions of the different elements are the underlying bedrock to the car’s look and character. Long hood, short rear is the classic sportscar proportion, for example, and there’s many other ratios that just work, for a given car. When they go wrong, though, there’s no hiding it. So what’s the worst? It’s funny, but this was a tricky one to pick an example for, partially because I personally love some quirky designs. I think stubby and tall can work in the right context, for example. But some cars just seem a bit off, even if I like them — like the AMC Marlin, maybe, or certain Bristols. 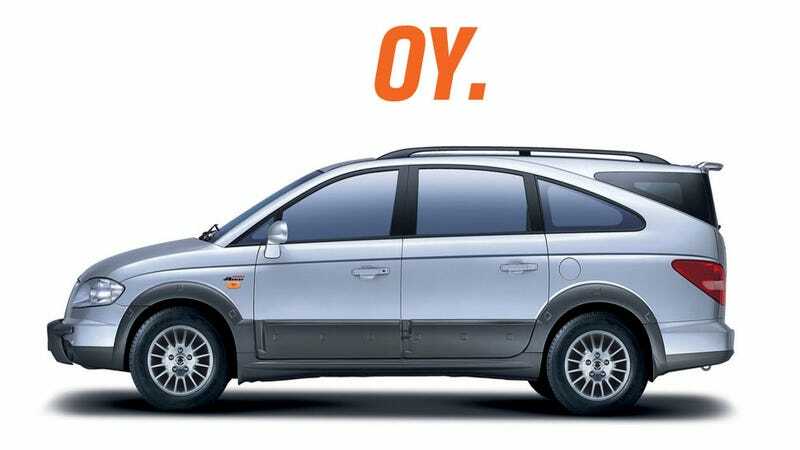 But I think one of the worst may be the SsangYong Rodius. I weirdly like the strange back of the Rodius — though I know it is weird weird weird, but I think the hood is the real problem here. It’s at once too stubby and yet too long. Too small, yet it would all be better if it was a true one-box van and it wasn’t there at all. It’s just wrong in every way, and the whole, already top-heavy and strangely bulky form, with wheels that seem to be just the wrong size, just doesn’t work. The Buick Rendezvous is pretty close to this mess, too. I know there’s lots more out there, so come on, let’s make this comment section a real shitshow of bad design! It’ll be fun!